Imagine it. 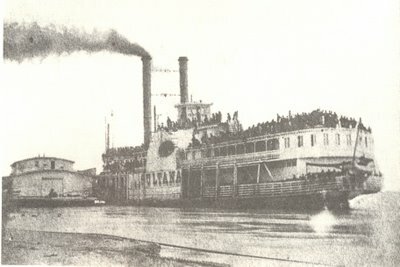 Upwards of 2,200 former prisoners of war, only recently released from the Confederate prison pens at Andersonville, Georgia, and Cahaba, Alabama, crowded onto a riverboat built to accommodate 300-some, steaming up the Mississippi River, headed for Cairo, Illinois, and points home. Emaciated, broken, scarred—these men were survivors. They survived camp life in Federal armies, a disease-ridden experience that killed more men in the Civil War than did bullets. They survived battle, too, before being captured. Then, they survived the obscene death rates attendant to Civil War POW camps, including Andersonville, the deadliest of all. The war finally ended, and POWs North and South were released. The ragged survivors of Andersonville and Cahaba made their way by boat, on foot, and by rail, to Vicksburg, where the government promised private steamboat operators a per-person rate to transport the freed soldiers upriver to rail connections in Illinois' Little Egypt. When the Sultana got underway, every surface, every nook and cranny, was occupied by a soldier. Looking at the last known photo of the boat, taken at Helena, Arkansas on a coaling stop, the crowded conditions on the boat are clearly discernable. In the early morning hours of April 27, 1865, the Sultana's passengers were mostly asleep—at least those who could find a patch of deck, or a wall to lean against. When the recently-patched boilers exploded, many men were killed outright and dozens, or hundreds, were thrown into the water. Hundreds more quickly abandoned the boat as fire ravaged the wreckage. Untold numbers perished in the panicked mass of men clutching at anything and everything in the immediate vicinity of the burning vessel, where swimmers and non-swimmers alike struggled in keep their heads above the swift, freezing current. Even many of those who were strong, who were good swimmers, and who managed to separate from the pack, surely succumbed to the current and the elements at a time when the Mississippi was out of its banks for miles, flooding the lowlands in both directions. The lucky ones found a snag, or a half-submerged treeline, and managed to hold on till morning. Other fortunate soldiers were plucked from the river by rescue boats. The toll was staggering. Of the roughly 2,200 men and civilians on board, only about 586 were pulled from the water alive. Of those, another 200 or so perished soon after, leaving about 300 men to tell the tale. It's hard to know why the largest, most costly maritime disaster in our nation's history remains so obscure. No doubt it's a combination of things, like the fact that it occurred on western waters, and overriding focus of the print media on other big stories, like the surrender of Confederate armies, the end of hostilities, and the assassination of President Lincoln. Chester Berry of the 20th Michigan Infantry sought to memorialize the event, and the dead, by collecting as many firsthand accounts as possible. His book, Loss of the Sultana and Reminiscences of Survivors, was published in 1892, and included 134 testimonials (remarkably, nearly ½ of the survivors). The University of Tennessee Press just released a facsimile reprint of Berry's book, along with a meaty new introduction by David Madden. In a couple days I'll post a link here to my review of that book. One survivor whose story does not appear in Berry's book is Romulus Tolbert, my wife's great-grandfather, whose gene pool continues to thrive in my three children. Romulus was a survivor extraordinaire. 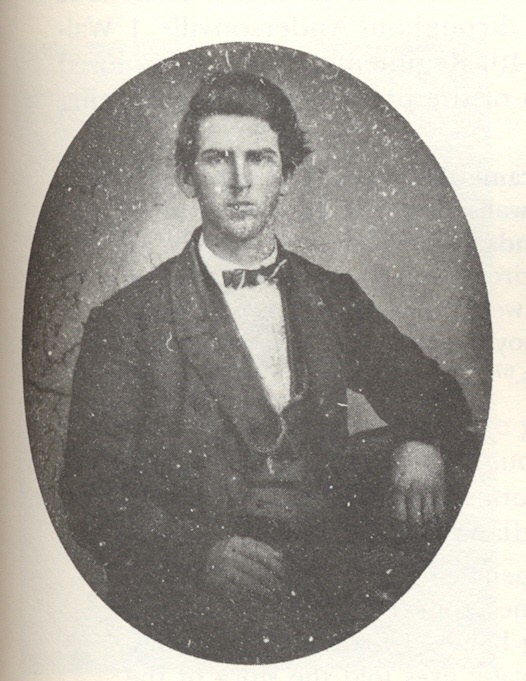 He joined the 39th Indiana infantry early in the war and saw action at Shiloh, and Stones River. In Sherman's Atlanta Campaign, on September 10th, 1864, Romulus—now veteranized with the 8th Indiana Cavalry—ran into an ambush near Campbellton, Georgia, suffering two gunshot wounds, one through the neck and jaw. He was carried to a private home in Alabama and nursed until well enough to be transferred to Cahaba prison, near Selma. People familiar with accounts of Cahaba will think of the time the Alabama River flooded, causing the prisoners to live on platforms, amidst thigh-deep water, for days. Rom was there for that, and survived it to. He had four brothers in other Indiana regiments, three of them in the famed 22nd. His oldest brother died at Perryville. No one in my wife's family knew about Romulus's Sultana adventure, or even that he had been wounded, or taken prisoner. 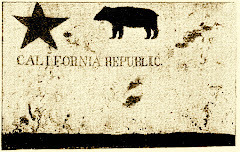 We found that in his pension files, in the mid-80s, when I first started getting obsessive about Civil War connections. Details are scant. All that is known about his Sultana experience is that he lived, was taken to Adams hospital in Memphis, and was treated for "chills." He returned to Indiana and farmed until his death at age 77. Whether because of stoicism, or the bad memories it stirred, it wasn't a story that got handed down. We don't know if Chester Berry located Romulus and solicited his tale. Perhaps he simply declined to respond. 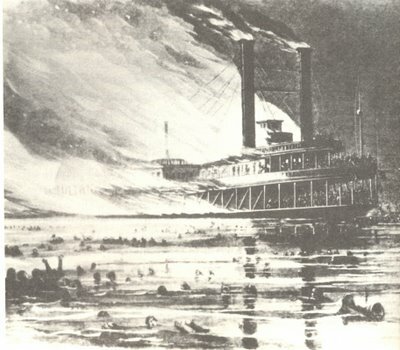 Some that did respond had nothing more to say about that night than Abraham Cassel of the 21st Ohio, “At the time of the explosion I swam about three miles and was rescued at 10 a.m., more dead than alive.” On this day, 141 years after Romulus took to the water, and somehow managed to find dry land, I honor all those who perished, and I honor those who survived. We can take inspiration from the near-death tales of those who’ve walked away from calamity. Mostly, our problems just aren't that big. If I start to fret too much, I'll endeavor to remember A. C. Brown's entry in Berry's book. A member of the 2nd Ohio Infantry, captured at Chickamauga, he spent time in numerous POW camps from Belle Isle to Andersonville before catching a ride on the Sultana. Stripped clean in desperate struggles with drowning men in the icy water, Brown swam for miles until catching hold of some branches above a submerged island. "I climbed a tree," he recalled, "and the water surrounding it was about ten feet deep. Now, when I hear persons talking about being hard up, I think of my condition at that time—up in a tree in the middle of the Mississippi river, a thousand miles from home, not one cent to my name, nor a pocket to put it in. . ."
I've seen a few Civil War horses in my time, all stuffed. 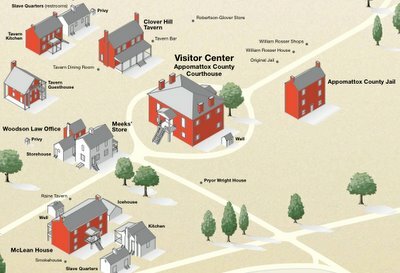 Winchester, for one (nie Rienzi), — in the Smithsonian, and Stonewall Jackson's Little Sorrel at the museum of the Virginia Military Institute (and, as an equestrian aside, I've stood over Traveller's grave at Washington and Lee. What would possess someone to toss coins onto the grave of Robert E. Lee's horse?). The non-Civil War stuffed horse I've wanted to see since childhood, but still have not seen, is Comanche, of Little Bighorn fame. I hope Commanche will be there for me when I find the time, but lately, ever since about 1977, Kansas has not been along the routes I've traveled. But I digress. This post is about a horse named Fly. Bridgette Savage of Stanford, Indiana — which looks to be in the vicinity of Bloomington — has penned, and illustrated, a true-to-life tale based on the service of George Barrett and his horse, Fly, of the 1st Indiana Cavalry (formed from the 28th IN Volunteer Infantry). It's a book for young people, but based on the two articles I've read, here, and here, I cannot tell how young. The Christian Science Monitor piece shows some of Savage's illustrations, and I may pick up the book for the artwork alone. But Fly is not stuffed. Fly can be seen at the skeletal level in New Harmony, Indiana (again, photo of author and subject can be seen here). In all my years in Evansville — where the 1st Cavalry was raised, and where I met my Hoosier wife — I never heard of Fly's bones. And in my two or three visits to nearby New Harmony, home to not one, but two full-fledged efforts at creating a utopian community, still, I saw no dead horses, stuffed or otherwise. But that's another story. What the hey. I've decided to diverge from the Dimitri model and allow comments on this blog. I've gotten some worthwhile feedback via email, and by way of The Civil War Forum, and thought it would be interesting to allow that kind of response to be grouped with the actual post. Replies will be reviewed before they're published, so most of the garbage will be filtered out. But I promise to allow an occasional angry, illiterate zinger (the "cost of doing business" in Civil War circles). One of my favorite parts of the Al Franken show on Air America is the "hatemail" segment, when he reads a featured email. What if there was a war and nobody came? This just in — the 141st anniversary reenactment of the Battle of Selma is officially cancelled. After peaking with upwards of 2,000 registered reenactors at the 130th anniversary, this year's organizers could barely muster a couple hundred participants. I have no idea if this is a larger trend throughout the "Living History" hobby. One reason given for the poor Selma registration was the high cost of fuel. I suspect that after general interest in the Civil War was rekindled during the centennial years of the early 1960s, leading to exponential growth of book sales, reenacting groups, and Civil War Round Tables over the next couple decades, interest is beginning to ebb. Certainly that's the case with Civil War-specific book sales. I've also read somewhere that interest in historic wars, which for some has an uncomfortably naive element of nostalgia about it, wanes during times of actual war. Of course the Selma event has some other things going against it. For one thing, the historic event there was not a momentous battle so much as confirmation that by April of 1865, Federal cavalry columns could effectively operate with impunity throughout the Confederate heartland. For another thing, the immediate base of paying spectators in Selma is 69% African American, not generally considered the target audience for mock battles featuring overweight white guys, many in Confederate uniforms, fighting for their "rights." Not that fighting for one's rights isn't of interest to the people of Selma. According to the Los Angeles Times article I read today (registration required), the hottest-selling item at the Selma Visitor Information Center is a shirt commemorating the Edmund Pettus Bridge, where marchers, 100 years after the Battle of Selma, faced down Alabama State Troopers. A couple of weeks ago, when the Civil War Forum visited Nashville, our first stop was the Nashville National Cemetery to see the new monument to United States Colored Troops. This moving memorial, set as it is among row after row of USCT gravestones, was in notable contrast to a little wartime cemetery we had visited two days earlier on the Stones River battlefield, near the Hazen Monument (pictured on their start page). There, a single USCT grave stands segregated just outside the brick wall of the proper burial ground. Our guide at Nashville, if I heard him correctly, mentioned that the Nashville monument was one of only four in the nation memorializing USCT in this country. That sounded unlikely to me, and after digging around a bit I found reference to a number of plaques, monuments, and memorials to black Union troops. One report, I should say, asserts that there are only four Veterans Affairs-operated national cemeteries that boast some sort of monument to USCT. Most likely, that's how our guide settled on the figure "four." The most famous monument to black Civil War troops is probably the Robert Gould Shaw / 54th Massachusetts sculpture in Boston. Far more interesting, I think, is the African American Civil War Memorial in Washington D.C., captured in various angles at this site. The Nashville statue is beautifully done. But more than a few people in our group had trouble making sense of the ambiguous phrasing on the plaque. It's hard for me to imagine how something so long in the making, something meant to last for generations, and for which the precise wording presumably required the input and oversight of numerous individuals, could result in a monument that causes even casual students of the war to mutter, "huh?" The head scratching, of course, is due to the fact that the commonly published figures for USCT serving in Union armies during the Civil War is between 180,000 and 200,000. Back at home, I searched out some articles on the monument and discovered that the 20,133 refers to the number of USCT who hailed from Tennessee. Strange that on a monument to United States troops, in a national cemetery, such a grammatically critical qualification was left off. As it is, untold numbers of visitors will now leave with the solid impression that United States Colored Troops, who fought so heroically on many a battlefield, numbered only about one-tenth of what we know to be case. 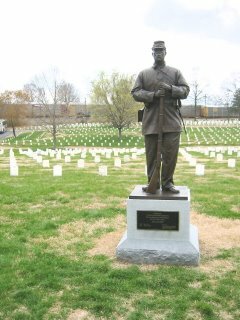 Whether the plaque is ever edited or replaced, it remains a noble statue, standing sentry among the nearly 2,000 USCT buried here. Couldn't help but notice, though, in the Knoxville newspaper article linked to above, the comments of one Kwame Leo Lillard whose multiple masters degrees failed to touch upon black soldiers — largely escaped slaves — who fought against the Confederacy in Union regiments. Mr. Lillard's group apparently originated the idea for the statue, and launched the ultimately successful fundraising. "There were black soldiers in the Confederate army too," Lillard is quoted as saying, "and we need to erect a monument to them." Hate to break it to him, but using the afore-mentioned formula for composing memorial plaques — listing just one-tenth of the total, or only those from Tennessee — the number of men honored by a Black Confederates statue would be less men than it takes to build the statue. Good luck raising funds for that one. General R.E. Lee, Commanding C.S.A. Your note of last evening in reply to mine of the same date, asking the conditions on which I will accept the surrender of the Army of Northern Virginia, is just received. In reply I would say that, peace being my great desire, there is but one condition I would insist upon, — namely, that the men and officers surrendered shall be disqualified for taking up arms against the Government of the United States until properly exchanged. I will meet you, or will designate officers to meet any officers you may name for the same purpose, at any point agreeable to you, for the purpose of arranging definitely the terms upon which the surrender of the Army of Northern Virginia will be received. General: I received at a late hour your note of today. In mine of yesterday I did not intend to propose the surrender of the Army of Northern Virginia, but to ask the terms of your proposition. To be frank, I do not think the emergency has arisen to call for the surrender of this army, but, as the restoration of peace should be the sole object of all, I desired to know whether your proposals would lead to that end. I cannot, therefore, meet you with a view to surrender the Army of Northern Virginia; but as far as your proposal may affect the Confederate States forces under my command, and tend to the restoration of peace, I should be pleased to meet you at 10 A.M. to-morrow on the old state road to Richmond, between the picket-lines of the two armies. General: I received your note of this morning on the picket-line, whither I had come to meet you and ascertain definitely what terms were embraced in your proposal of yesterday with reference to the surrender of this army. I now ask an interview, in accordance with the offer contained in your letter of yesterday, for that purpose. Your note of this date is but this moment (11:50 A.M.) received, in consequence of my having passed from the Richmond and Lynchburg road to the Farmville and Lynchburg road. I am at this writing about four miles west of Walker's Church, and will push forward to the front for the purpose of meeting you. Notice sent to me on this road where you wish the interview to take place will meet me.